Spain successfully raised 2.345 billion euros on Thursday in the country's first debt sale since its credit rating was cut last week, easing investors' immediate fears of contagion from Greece's fiscal woes. 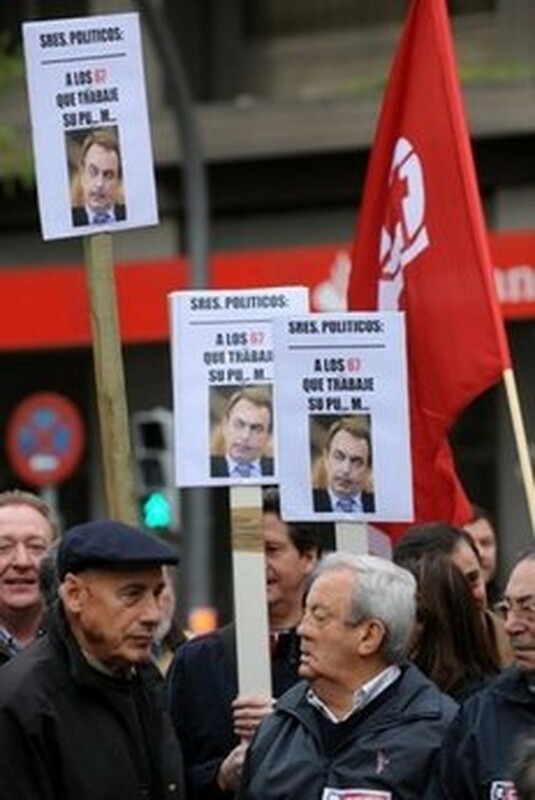 People hold flags and banners during a demonstration called by trade unions against austerity plans announced last month by the government of Prime Minister Jose Luis Rodriguez Zapatero. But the yield on the notes due April 2015 rose to an average of 3.532 percent compared to 2.81 percent the last time such bonds were issued in March, a spokesman for Spain's secretary of state for the economy told AFP. The five-year bond was 2.3 times oversubscribed, the highest ratio so far this year for a government debt sale, with demand coming from both foreign and domestic investors, he said. "It is a sign that while we have to pay higher interest rates, interest in Spanish debt has not diminished," the spokesman said. Spain had said it expected to raise between two and three billion euros. "We did not expect that it would go this well," a market source told AFP. It was the first time that Spain returned to the bond market since ratings agency Standard & Poor's cut the country's long-term credit rating to "AA" from "AA+" on April 28 on fears the country's poor growth prospects could further weaken its public finances. Spain's economy, which is more than four times the size of Greece, has been contracting since the second quarter of 2008 following the collapse of a property bubble. The public deficit reached 11.2 percent of gross domestic product last year, almost four times the limit of 3.0 percent imposed on the 16 nations that use the euro single currency, compared with 13.6 percent for Greece. The government announced a 50 billion euro (66.5 billion dollar) austerity package earlier this year as part of its drive to cut its deficit to within the 3.0 percent eurozone limit by 2013. The plan includes cuts in government spending, a virtual freeze in the hiring of civil servants and some tax rises. It has also proposed raising the legal retirement age from 65 to 67 and wants to cut the cost of firing workers as part of efforts to revive the economy and slash the unemployment rate, which is just over 20 percent. Economy Minister Elena Salgado said Wednesday that Spain would not be announcing extra austerity measures in response to the loss of confidence among investors but would instead concentrate on implementing the programme it has already approved. "Rather than announcing new measures, what we have to do is enact what we have already announced," she told news radio Cadena Ser, adding the most recent economic indicators show Spain was starting to emerge from recession. "We are having a complicated time on financial markets but, in terms of the economic data, we are recovering, we have positive data and we are far better off than a year ago," she said. Spanish industrial production rose in March on a 12-month basis for the first time since April 2008, the national statistics institute said Wednesday. Spain, which has the eurozone's third-largest deficit after Ireland and Greece, was last cut by S&P in January 2009 when its credit rating was lowered one notch from AAA, the highest possible rating. S&P’s move on Spain came one day after it cut Portugal's long-term credit rating by two notches and reduced Greece's rating the junk status, the first eurozone country rated less than investment grade since the launch of the euro.